Women and men in the Coral Gables area are increasingly seeing Dr. Shaun Patel for natural, subtle, beautiful but believable results with dermal fillers. Dr. Shaun Patel of Miami Skin and Vein in Coral Gables is an expert in nonsurgical facial aesthetics. He uses dermal fillers in combination with other treatments to improve facial proportions, correct age-related volume loss, soften facial lines and wrinkles. The goal is improved facial harmony, a more youthful and energized appearance to the face. For a consultation with Dr. Patel in and around the Miami or Fort Lauderdale area, call 786-618-5039 today. There are many fillers to choose from, and sometimes it can be difficult to determine which filler is right for you. Here are a few tips to point you in the right direction. Don’t worry, though, because Dr. Patel evaluates each of his patients in person, determines their specific cosmetic concerns, provides a list of recommendations, and creates a customized cosmetic treatment. He offers all of the latest FDA-approved dermal fillers and is always adding newer fillers to his practice as they are approved. 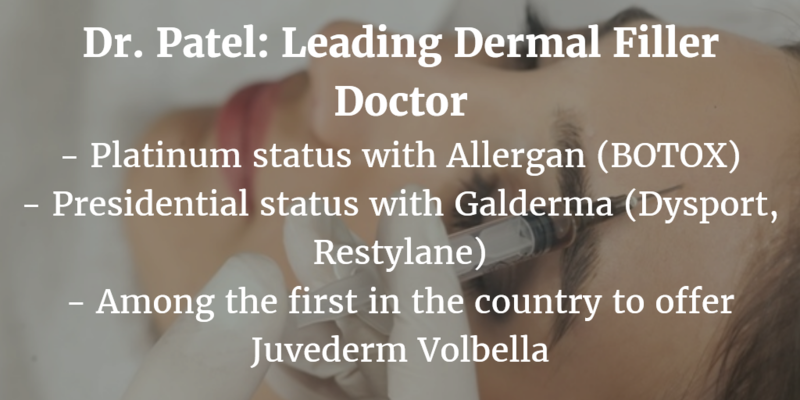 Dr. Patel was one of the first injectors in South Florida to offer Restylane Silk, Juvederm Volbella, Restylane Refyne, and Restylane Defyne soon after their initial FDA approval. Juvéderm Fillers – These fillers are the most popular hyaluronic acid-based fillers. They are ideal for treating a range of aesthetic concerns including lines, folds, and volume loss. The Juvéderm family of fillers includes Juvéderm Ultra/ Ultra Plus, Juvéderm Voluma, and Juvéderm Volbella. Restylane Family of Fillers – Similar to Juvederm, Restylane soften lines and wrinkles. This is Dr. Patel's go-to-filler for the undereye volume loss, tear troughs, and dark circles. There are a variety of Restylane fillrs such as Restylane Silk, Lyft, Defyne and Refyne, each designed with their own unique purpose. Belotero – Silky consistency for superficial lines and undereye dark circles and volume loss. Radiesse – Tiny beads of calcium hydroxylapatite provide immediate volume, and stimulate on-going production of fresh collagen. Also works great for rejuvenating your hands! Sculptra – Poly-L-lactic acid is great for panfacial revolumization. It stimulates your body to produce it own collagen for gradual, long-lasting rejuvenation. See our dermal fillers before & after gallery! Of course, it is important to remember that every patient’s body is different and every patient can respond differently to the fillers based on such factors as diet, exercise, baseline metabolism, sun-exposure, and smoking. In general, Dr. Patel recommends maintenance treatments so that the results never completely return to baseline. He also recommends that all patients start an at-home skincare regimen to maintain their results. This regimen usually includes a combination of antioxidants, sunscreen, moisturizers, and retinol. View our skin care products for multiple medical-grade options. A filler may last a longer or shorter duration on different parts of the face. For example, the lips tend to have lots of movement and so filler breaks down faster. The undereyes, cheeks, and temples have less movement and so filler injected in these parts of the face usually last longer. The times listed above may differ from what the individual manufacturers (Allergan, Galderma, Merz) have on their own websites or literature. The times listed above are what Dr. Patel believes to be accurate based on his own experience having treated thousands of patients with fillers. To learn more about the different factors that determine how long a filler last, please refer to Dr. Patel's recent blog post on filler longevity. There are many benefits to using fillers for facial rejuvenation, including safety, effectiveness, longevity, and versatility. For younger patients, it is also important to note that by starting injectable treatments early, a patient can prevent signs of aging and postpone the need for surgical interventional indefinitely. All cosmetic treatments at Miami Skin and Vein are performed by or with the oversight of Dr. Shaun Patel. Call our office today at 786-618-5039 to schedule an appointment.